Another day I sprawled across my bed, bumping into kid's toys left behind. My teething baby and stubborn two-year-old unraveled me this day. Arms wide open, eyes shut, my exhausted body relented. I sought God amid back aches, frustrations, and tears. And like a loving father, he scooped me in his arms, quieting me with his love. One day, on a miraculous day, my soul was overwhelmed by his goodness. Like getting caught up in a downpour on a sweltering, summer day, the Lord's graciousness saturated my soul. He made paths through pastures deemed impassable. His mercies were overflowing. Amid joys indescribable, I sought God with loud praise. My hands were deep into scrubbing my kitchen sink the other day when I heard his voice. It was so clear, distinct, I envisioned him near me. As usual, I felt overwhelmed this day, and my driven mindset clouded the moment. All I was thinking about was the numerous tasks needing to be accomplished by the day's end. I was determined to complete them all. But in that moment, I felt as if Jesus was wrapping his arms around me, placing his hands over mine, inviting me to let go and follow him. It was an invitation. An invitation to seek him. 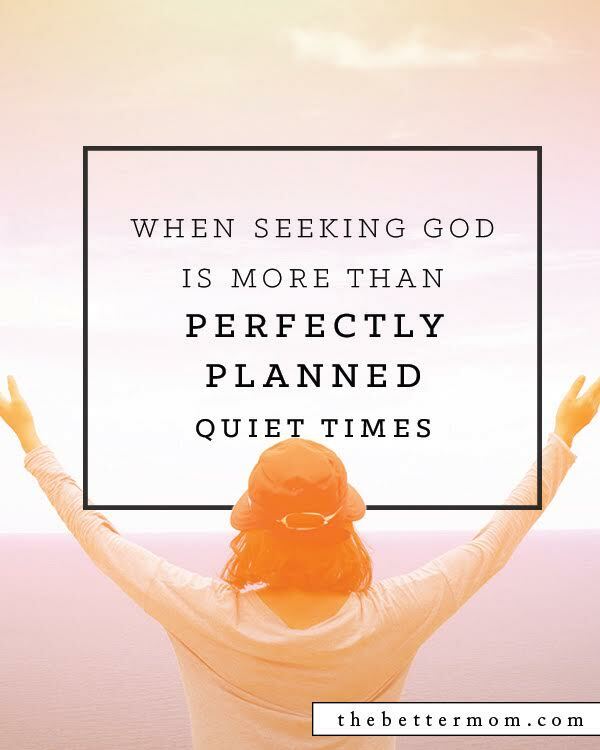 Because seeking the Lord isn't all about perfectly planned out quiet times. I learned that years ago. My moment of clarity came the year I cradled my firstborn in my arms.